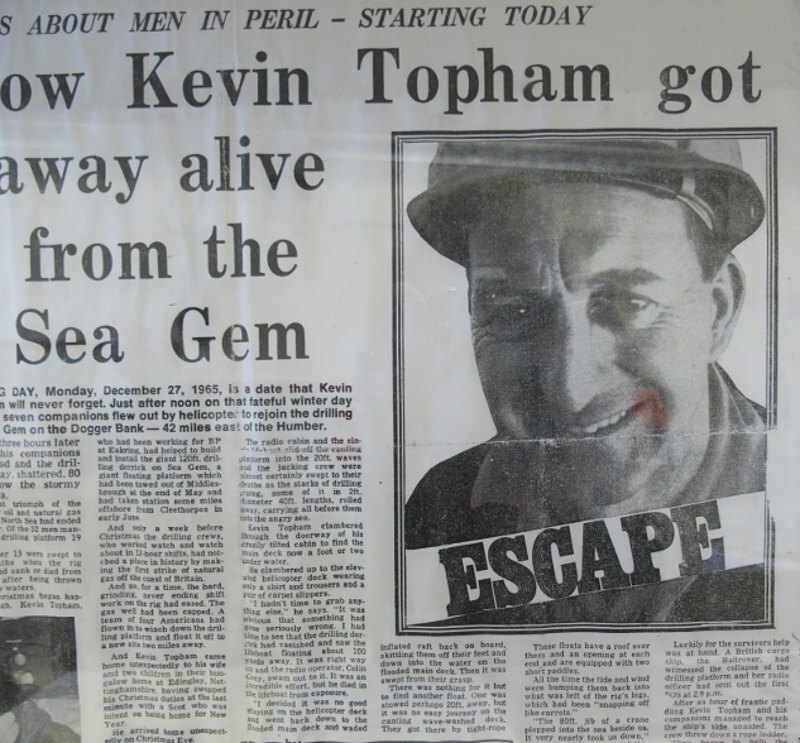 Kevin Topham has had an eventful life. Born in Retford, Nottinghamshire, in the English East Midlands, he joined the RAF when still in his teens to fight in WWII. His four brothers were also all in the services and miraculously all survived. 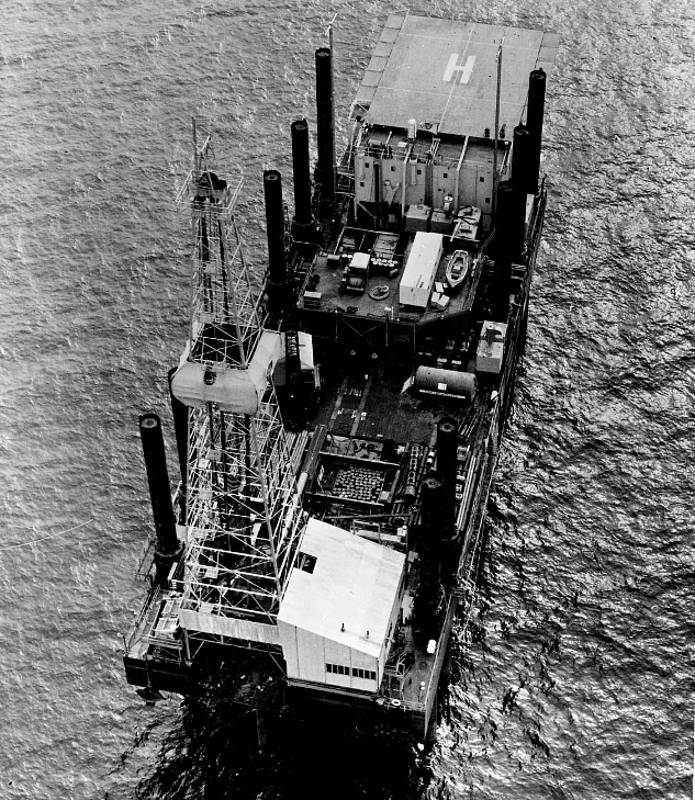 The team continued drilling to over 3,000m and in December 1965 BP and the UK government announced that testing had shown that there was sufficient gas in the field to justify building a pipeline to bring it ashore. Having completed testing, the plan was to move the Sea Gem to a new drill site. Working a 10-day rota, Kevin expected to remain on board over Christmas 1965 – but a message came through on Christmas Eve saying that 12 personnel would be allowed home for Christmas, on standby for moving the rig when the weather permitted. Kevin continues the story. One of the many articles about the disaster. “We talked among ourselves and those who wanted to have New Year off – mostly the Scots – stayed on board and the rest of us were delighted to be flown home to spend Christmas with our families. But on Boxing Day [26th December] there was a knock on the door and the BP driver told me I’d been recalled to move the rig and he’d pick me up early the next morning. Nine of us flew out to the rig on 27th December, looking a bit cheesed off at being recalled; four never returned. “We arrived in time for an excellent late Christmas dinner, and then went to our cabins to change into working clothes. The rig was in the process of being ‘jacked down’ [when the hull is lowered down the legs until it is floating, before the legs are raised from the seafloor]. I wasn’t due on shift until we began the move later that night, so I sat on my bed and picked up a magazine. Suddenly, there was a sharp judder throughout the barge, and I felt like I was going down in a lift. The shelf came off the wall behind me and hit me on the head and as I made for the door there was a terrible lurch and the floor tilted to about 45°. Dashing outside, I realised that two of the legs had collapsed and the rig was rapidly going over. The derrick had disappeared and so had the radio shack – there had been no time to send out a mayday call. We grabbed our lifejackets and ran; I was just wearing a shirt and trousers and my slippers. 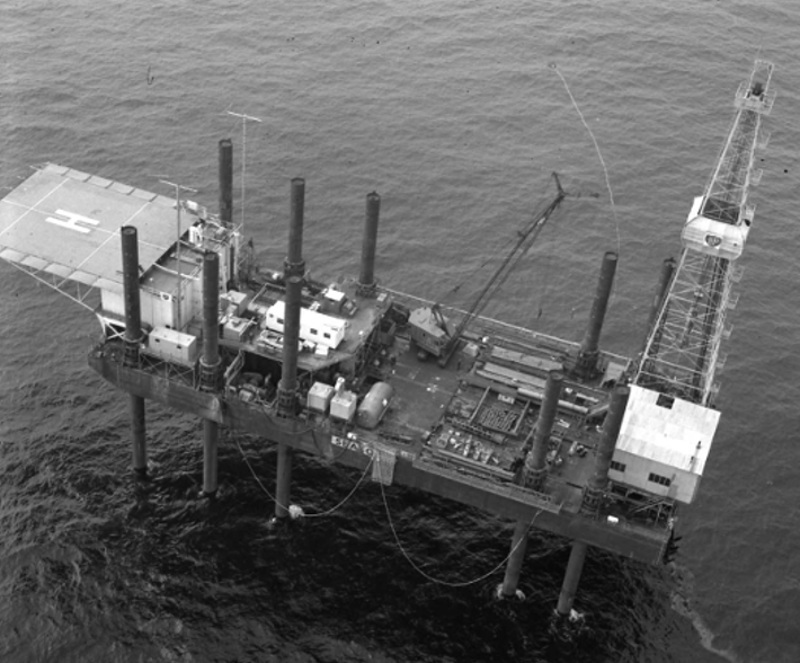 “Initially I went to the highest point on the rig, the helideck, along with a number of other men, but spotting the empty lifeboat, which had been set adrift by the rig lurching, I determined to swim out to it, so went back down to the deck with Colin Grey, a radio operator, who had flown out with me earlier that day. By now the lifeboat was maybe over 100m away, and the sea was very rough with waves over 6m high, and I didn’t think I’d manage to reach it, but Colin was a champion swimmer, so he dived in and I saw him reach the lifeboat and clamber in. The Sea Gem from the air. (Source: BP) Although the Sea Gem had not been able to send out a distress call, a passing cargo ship, the Baltrover, saw the disaster unfold and had immediately radioed for assistance. By the time the rescue helicopters arrived there was nothing to be seen of the Sea Gem but one of the broken legs sticking out of the water, a mass of debris – and empty life-rafts. 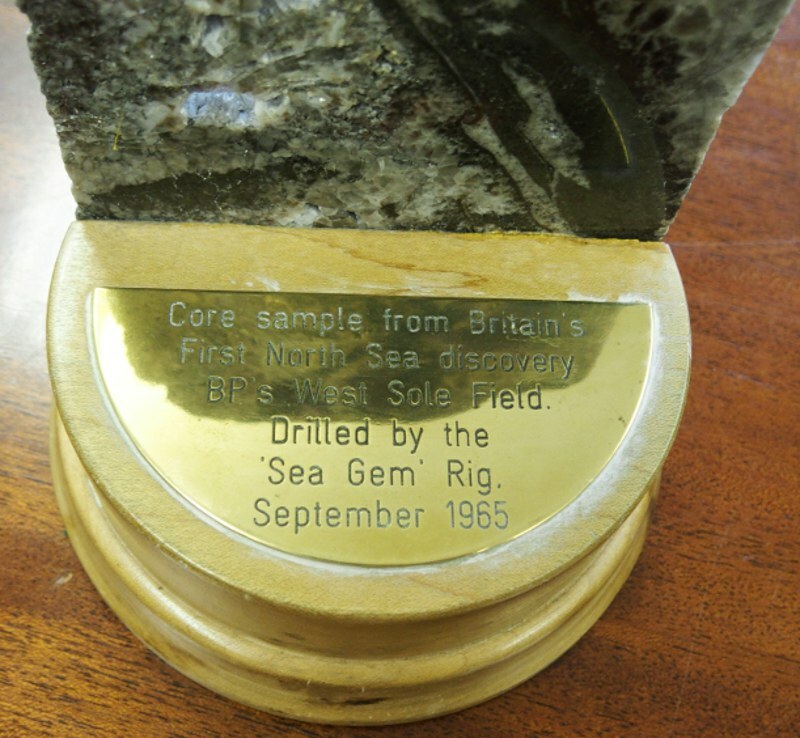 'A piece of history', core sample from West Sole. (Source: Jane Whaley) Kevin stayed with BP, working in maintenance at Eakring, before moving to the Central Generating Board, where for 25 years he specialised in safety matters. 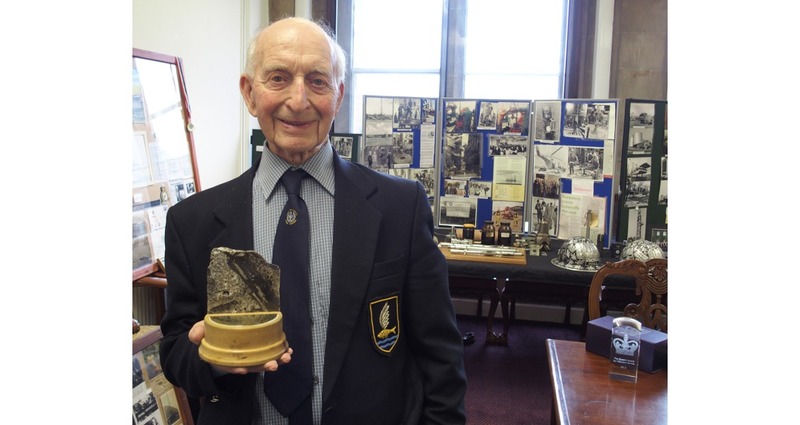 In his retirement he became a co-founder and curator of the Dukes Wood Oil Museum in Eakring, which celebrates ‘Churchill’s best-kept wartime secret’: the Dukes Wood oil field which kept the ships and planes working during WWII (see The Yanks are Coming, for the story of Dukes Wood). The Sea Gem disaster left a legacy to the UK offshore oil industry, as many new rules for operating were made as a result of the tragedy. These included more and better safety equipment, the requirement for an Offshore Installation Manager in overall charge, and a permanent standby vessel close to each rig or platform. The men who survived the disaster continue to meet regularly, the last meeting being in February 2016, when they commemorated the 50th anniversary of the tragedy, although there are now only three of them left. Kevin says, “It is important that those of us who survived get together to remember the men who died and pay tribute to those who saved us. “Eh, it was a hell of a day,” he sighs. “Boxing Day and all. I still don’t like Boxing Day, or Christmas much – but, anyway, life has to go on. Have you seen this?” And he hands me a mounted core from the well where Kevin Topham and the men of the Sea Gem found the first commercial hydrocarbons in the UK North Sea. A piece of history. Bert Blanche started his long career in the oil industry as a roughneck in Texas in 1930. His son Bruce, who became a geologist in the oil industry, tells us his story.